Senior regional director for Apple's Asia-Pacific operations Donald Shruhan will reportedly visit the Bucheon Sosa police station in Bucheon, Gyeonggi, on Friday to present the plaque to the officers involved in the regional crackdown. The criminals were locally distributing fake Apple charing cables and earphones, reports the Korea Herald. The knock-off products are said to have been imported from China, with police still working to trace how the goods entered the country. The apprehended distributors are also under investigation on suspicions of fraud and trademark violation. Shruhan is currently leading Apple's anti-counterfeiting operations in China, and previously worked with Pfizer to crack down on counterfeit Viagra sales and production. Counterfeit products remain an issue for Apple and other device vendors, with consumers tricked into buying the fake versions or tempted by the cheaper knock-offs, as they can potentially be dangerous and cause harm to devices or human life due to not undergoing the same safety checks as real products. The sale of fake goods can be highly profitable to criminals taking part in such schemes. In February 2018, one Chinese national living in the United States pleaded guilty to conspiracy and trafficking of counterfeit Apple products, which reportedly earned him more than $1.1 million. 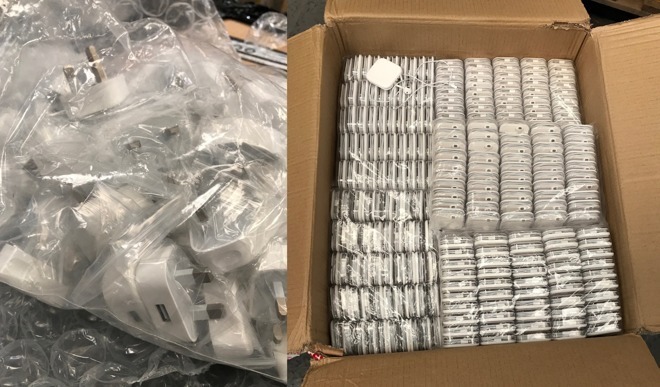 A six-month investigation and a police raid on a warehouse in London in August 2017 uncovered a collection of fake Apple products worth an estimated $1.69 million. Sometimes the crimes relating to Apple products are not quite as direct. Apple has spent five years combatting iPhone repair fraud in China, where components were stolen from working iPhones that are then submitted for warranty repairs, an issue that reportedly cost the company billions of dollars. It is possible the safety concerns of fake accessories could be alleviated in the future, as the introduction of the USB Type-C Authentication specification could allow mobile devices to detect genuine cables and chargers, allowing only official and certified versions to actually function. Typo or Joke of the Day? Did the shipment belong to that guy on YouTube always bitching about Apple repairs? You know another video will be incoming with that dorky microphone of his across the cheek. Are the authors making a distinction between "counterfeit" (products purporting to be made by Apple) and unlicensed? Nobody except Apple shareholders care about the latter. If I don't want to pay the 2000% markup on a Apple charging cable, I should be able to buy a cheap non-branded knock-off and take my chances. Welcome.... these are clearly counterfeit products or there would be no mention of fraud or trademark violation. The MFi program covers various device connectors including the headphone jack, original dock connector and the newer Lightning connector, as well as AirPlay support. Companies joining the MFi program and passing certification tests are able to display certain MFi-related logos on their product packaging, like the "Made for iPod" badge. I have been using Rocketfish MFI certified cables for my iPhones for years. I think Best Buy has since replaced them with Insignia brand cables and peripherals. You can take your chances with any cheap cable you want. There are plenty on Amazon and ebay..you even buy them in bulk. I really love my RocketFish RF-MAB2 headphones. I paid like $25 for them when I bought my iPhone 4, and they're still going. I'm glad I bought replacement ear pads for them, though. I've gone through two sets, and only have two more left. I'll be sad when the last one wears out.